You know how you mean to do something, and know you should do it, but you never get around to it? Well, that's me with learning Drupal. But my friend Kyle (that's Kyle, in the hat) isn't a slouch like me. He actually went out and bough a Drupal book to learn from (while I, on the other hand, sit about twenty feet away from one every day, but have yet to crack it). Anyway: my library uses Adobe Dreamweaver to manage our website. But dealing with static html pages is cumbersome, and stands as a large barrier to getting more staff contributing (easily) to our website. So, using a tool like Drupal would be a great improvement - not just for site management, but also in usefulness for our patrons. I'm getting there. I'm also looking at expanding our WordPress installation, from running just our blog to containing our entire website. Or, we could use Joomla. Or Scriblio. Or Plinkit. Part of the problem is the myriad of tools to choose from. One thing that I have been looking into for one of my clients is Omeka (http://omeka.org/). Omeka is a wiki/cms solution for museums and libraries to catalog information in an online format. It is being developed at George Mason University specifically for historical institutions. Another tool. But from what I can tell (using it is invitation only, at the moment), it is neat, and they've got some interesting sites running it. I'm going to watch it and see where it goes. I know I've been talking about these CMS tools for awhile, but perhaps that's what new year's resolutions are for. We will migrate the website to a new platform by the end of 2008. Ah, we'll see. Oh, and one more thing: I recently read that there's a new drupal4lib group. Maybe with a support group, it'll actually happen. As a compliment to the previous presentations, Wes focused just on Linux as an operating system, rather than the applications that run on top of it. He started with an interesting evolutionary history of Linux, which put into context all of the different flavors available today, and why there are so many. He also pointed out that, even without knowing it, almost every internet user is already a Linux user, even if indirectly. Some of the post popular websites today (Google, flickr, Wikipedia and YouTube) are all being run on Linux platforms (and in Google's case, Wes said that over 450,000 Linux servers power the search engine - that is an unfathomable number of servers). 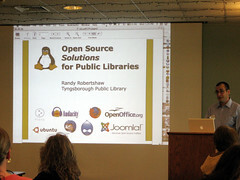 Randy has converted his small public library over to as much open source Linux applications as possible. His goal in this conversion was to save the library money by paying less for hardware and software, and by saving staff time in supporting the library computers. Randy's presentation focused mostly on available open source applications, such as Firefox, Drupal, Open Office, and on a company they use to maintain their Linux clients, Userful, and offered a lot of practical implementation tips (download his presentation below). 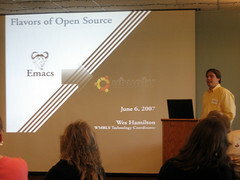 But Randy does not see open source software (OSS) as the be-all and end-all or library computing. He covered both pros and cons, in that it offers reduced cost and high flexibility, but the trade off is that the software isn't necessarily as high-quality or as stable as commercial software. When deciding to go with OSS, we really need to evaluate both what we want to accomplish as well as the available OSS tools, to find the best fit.